This documentation is for developers, technical architects and service managers interested in using GOV.UK Pay. If your problem or question is not addressed in this documentation, please contact us at govuk-pay-support@digital.cabinet-office.gov.uk, including any error messages you’re getting. GOV.UK Pay makes it easy for departments and agencies across government to take payments. It provides a standard set of GOV.UK branded pages which can be incorporated into a service to take payments, and a web-based admin console which enables services to administer and process payments taken through GOV.UK Pay. Much of GOV.UK Pay’s functionality can be incorporated into existing case management tools via our API. GOV.UK Pay is currently in beta development. During beta, GOV.UK Pay will support credit and debit card payments only. Over time, further payment methods, such as direct debit or eWallet, will be added. Your service only needs to integrate with GOV.UK Pay once to let your users make credit and debit card payments. When GOV.UK Pay is expanded to accept other payment methods, your service will not have to undertake any new integration. Using GOV.UK Pay will save your team time compared to implementing support for multiple PSPs and payment methods from scratch. The platform currently supports one-off payments (like fees, fines or licence payments). In the future, it will also support recurring payments, for example, monthly tax payments. There is no charge to use GOV.UK Pay. You will still need to pay your PSP's transaction fees. There are 4 departments and agencies currently partnering with the platform. To find out more about GOV.UK Pay, read our blogs and newsletters. Make sure you’re also familiar with the government best practice on deploying new software. If you are new to the GOV.UK Pay API, we recommend you take a look at the quick start guide, which explains how to access the API and start exploring what it can do. This section explains how to get started with our API Explorer. If your department or agency is participating in the beta, it will have a GOV.UK Pay service account (in some cases, it may have several service accounts, one for each service that is going to integrate with Pay). To use the GOV.UK Pay API, you will need your own individual staff account. A staff account is linked to a service account and can be used to create API keys for that service, as well as access the transaction history and service settings. Have your service manager email govuk-pay-support@digital.cabinet-office.gov.uk to get your staff account credentials. You'll receive access to a sandbox account which allows you to familiarise yourself and your developers with the platform before processing real payments. The GOV.UK Pay team will set up your service and provide you with login details for your account. Sign in to the self-service admin console with the sandbox account login details you received. Click on the API key section, then click Generate a new key. Enter a description for your API key. Your API key will be shown on the screen for you to copy. You must store your API keys away securely. Make sure you never share this key in publicly accessible documents or repositories, or with people who shouldn't be using the GOV.UK Pay API directly. Read our security section for more information on how to keep your API key safe. The quickest way to learn about the API is to use the API Explorer with the API key that you just created. Go to the API Explorer and click the blue “Add API Credentials” button. For API Key, enter "[YOUR-API-KEY]" (do not include the quotation marks), replacing [YOUR-API-KEY] with the actual value of your sandbox API key, as shown in the screenshot below. You do not need to put the "Bearer: " prefix which is required when calling the API from code; the API Explorer adds that automatically. For Label, enter "Authorization" (do not include the quotation marks). Make sure you are using an API key from your sandbox account on the self-service site, not the production account. To test the API Explorer, select Create new payment from the API Explorer Action dropdown menu. Click on the Body tab lower down to see an example JSON body that you would send when creating a payment. As well as details of the payment, you'll notice that you need to send a return_url when creating a payment. The reason for this is that users go to GOV.UK Pay hosted pages to actually make their payment. The return_url is the URL of a page on your service that the user will be redirected to after they have completed their payment (or payment has failed). Click the green Send Request button. If the API Explorer is set up correctly, you will receive a 201 Created response with a JSON body, confirming that the payment was created. Note that the JSON includes a next_url link. This URL is where your service should redirect the user for them to make their payment. Go to the service admin site. Select Transactions at left. You’ll see the payment you just made. This section outlines how your service will interact with GOV.UK Pay after integration. When an end user needs to make a payment, your service makes an API call to create a new payment, then redirects the user to the payment pages hosted on GOV.UK Pay. The end user enters their payment details (for example, credit/debit card details and billing address) on the Pay pages. Pay handles all the details of verifying the payment with the underlying Payment Service Provider. After the transaction reaches a final state, the end user is then redirected back to your service. When the user arrives back at your service, you can use the API to check the status of the transaction and show them an appropriate message. Let's walk through an example of the payment flow in more detail. Imagine that this is a page on your service, where the end user needs to make a payment. Note that this page might be the end point of a series of pages you host which allow the user to choose between a variety of possible payments. return_url: This is an HTTPS URL on your site that the user will be sent back to once they have completed their payment attempt on GOV.UK Pay. It must begin with https:// and not http:// or the request will not be accepted. It should not be JSON-encoded as backslashes will not be accepted. The beginning of the response confirms the properties of the attempted payment. The self URL (also provided in the Location header of the response) is a unique identifier for the payment. It can be used to retrieve its status details in future. The next_url is the URL where you should now direct the end user. 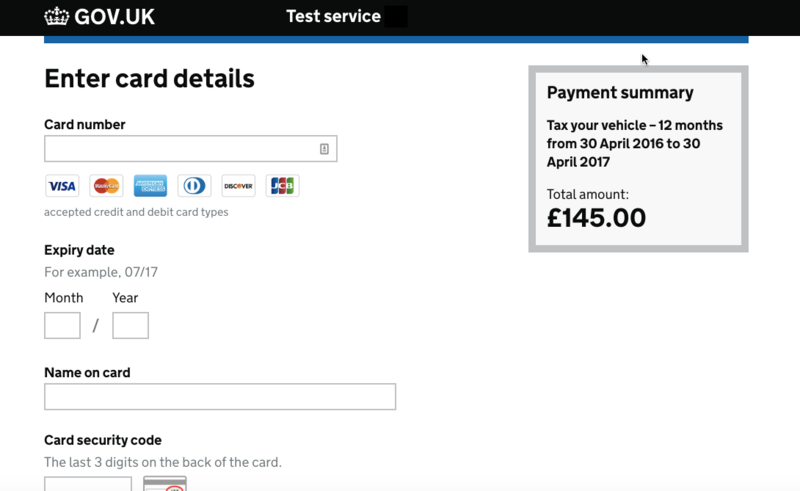 It points to a payment page hosted by GOV.UK Pay where the user can enter their payment details. Note that this is a one-time URL; after it's been visited once, it will give an error message. The page shows the description you provided as well as the amount the end user has to pay, making it clear what they're paying for. The user enters their payment details and clicks Continue. After confirming, the user is directed to the return_url you provided in the initial request. The link to try the payment again sends the user to the return_url you provided in the initial request. After the user attempts payment, GOV.UK Pay returns them to the return_url you provided in the initial request, whatever the status of the payment. See the Integration details section for more details about how to match the user to the payment. To check the status of the payment, you must make a Find payment by ID API call, using the payment_id of the payment as the parameter. The URL to do this is the same as the self URL provided in the response when the payment was first created. The status value describes a stage of the payment journey. The finished value indicates if the payment journey is complete or not; that is, if the status of this payment can change. In this example, the payment was successful, and the payment journey is finished. It is up to your page at the return_url to show an appropriate message based on the state of the payment. For example, for a completed payment, you would likely want to confirm that the payment has been received and explain what will happen next. For a failed payment, you should make clear that payment failed and offer the user a chance to try again. Now that you understand the payment process, see the Integration details section for more about how you can integrate your service with GOV.UK Pay. The same base URL is now used for testing and production. The API key you use determines if the actions are treated as sandbox test payments or processed as real payments. You can also use our interactive API Explorer to try out API calls and view responses. See the Quick Start Guide section for how to set up the API Explorer. Make sure you enter your sandbox API key to avoid generating real payments! 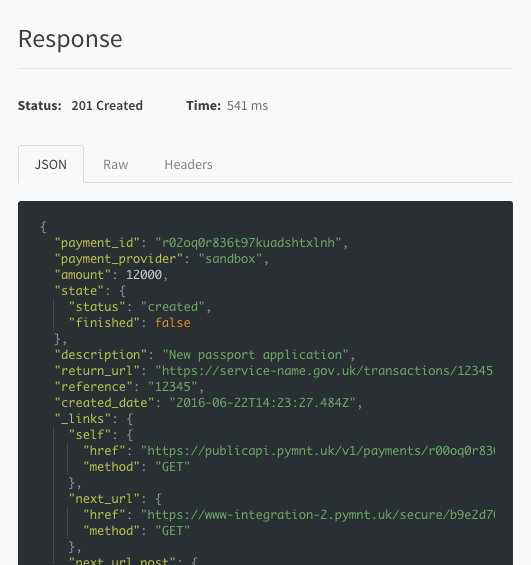 GOV.UK Pay authenticates API calls with OAuth2 HTTP bearer tokens. These are easy to use and consist of one component: your API key. Bearer tokens are specified in RFC 6750. When making an API call, you’ll need to add your API key to an "Authorization" HTTP header and prefix it with "Bearer ". This is an example of how a header would look. 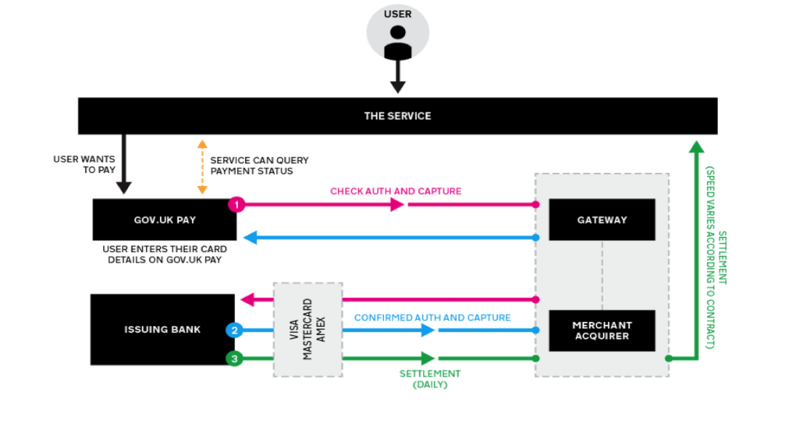 This diagram gives an overview of the payment status lifecycle and the possible outcomes. You can check the status of a given payment using the Find payment by ID API call. The response will include a status value as described in the table below, and a true/false finished value which indicates if the status can change. When an error occurs, you will receive these API codes in the body of the response. Note that the description provided is written to be informative to you, the developer, and is not intended for the end user. Also note that extra keys, e.g field, may be provided on a per-error basis. These error codes provide more information about why a request failed. General P0920 Request blocked by security rules Our firewall blocked your request. See Troubleshooting section for details. General PO999 GOV.UK Pay is unavailable The GOV.UK Pay service is temporarily down. These are the possible values of the card_brand parameter. There is a maximum rate limit for requests to the API from your service account. The limit is high and most services are unlikely ever to exceed it. If you do exceed the limit (that is, send a large number of requests in a short amount of time), you will receive P0900 errors. If this happens, you can attempt any rate-limited requests again after a second has passed. Please contact us if you want to discuss the rate limiting applied to your service account. 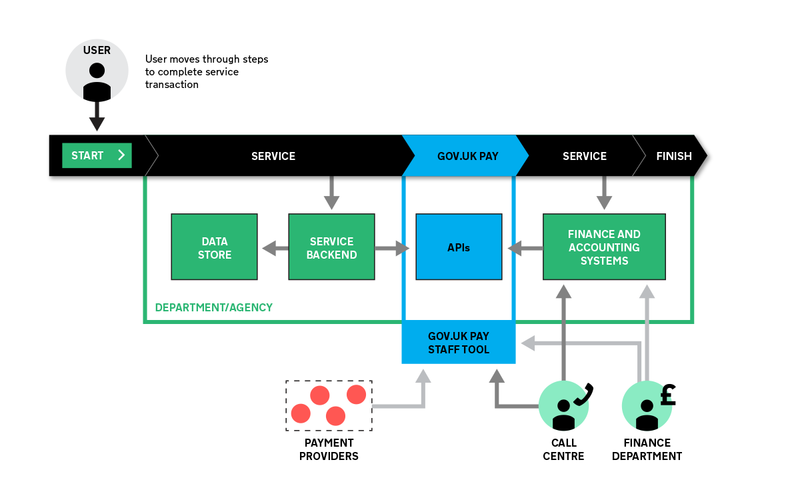 This section gives more technical detail about how to integrate your service with GOV.UK Pay. When you make a payment, you will need to supply a reference. This is a unique identifier for the payment. If your organisation already has an existing identifier for payments, you can use it here. You will also need to supply a return_url, a URL hosted by your service for the user to return to after they have completed payment on GOV.UK Pay. See the section below on Choosing the return URL for more information. You will need to store the URL from the Location header/in the self section of links in the JSON body (the same URL is shown in both places). This URL contains the GOV.UK Pay payment_id which uniquely identifies the payment. An authenticated GET request to the URL will return information about the payment and its status. It is important that you do not expose the URL with the payment_id publically, for example as a URL parameter or in an insecure cookie. You should store it as a secure cookie or in a database. You will receive the next_url to which you should direct the user to complete their payment. During the GOV.UK Pay beta, it is only returned in response to the initial POST call to create a payment, not on sub. It will only work once. You can track the progress of a payment while the user is on GOV.UK Pay using the Find payment by ID call. NOTE: The status of the payment will go through several phases until it either succeeds or fails. See the API reference section for more details. For security reasons, GOV.UK Pay does not add the payment ID or outcome to your return_url as parameters. 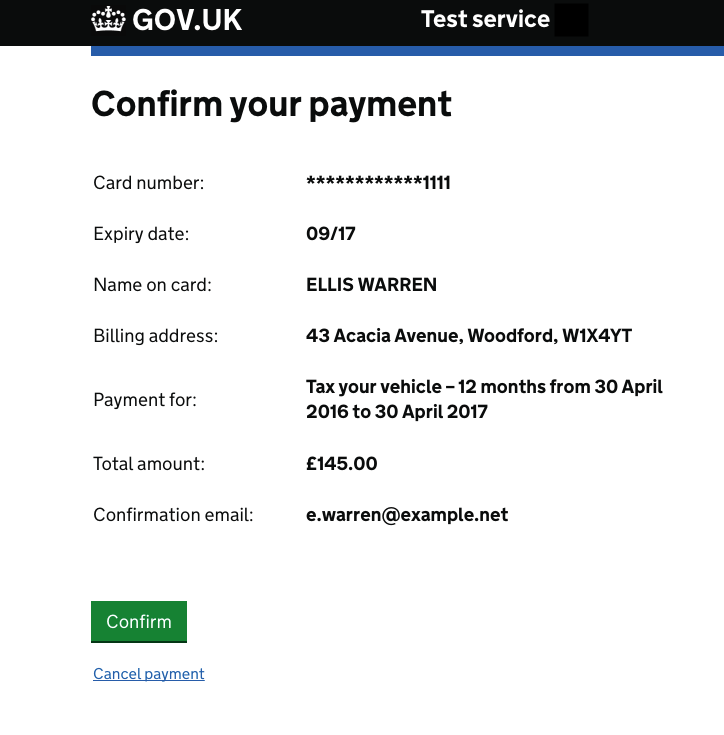 use a secure cookie containing the Payment ID from GOV.UK Pay, issued by your service when the payment is created (before sending the user to next_url). Users won't be able to decrypt a secure cookie, so a fraudster could not alter the payment ID and intercept other users' payments. create a secure random ID (such as a UUID) and include this as part of the return_url, using a different return_url for each payment. Since a securely generated UUID is not guessable, fraudsters will not be able to intercept users’ payments. Note: If you create an ID yourself, you'll likely need to store this in a datastore mapped to the payment ID just after you create a payment. Your service should use the API to check the payment status when the user reaches the return URL, and provide an appropriate response based on the final status of the payment attempt. The user may close their browser or lose internet connection in the middle of the payment flow on GOV.UK Pay. These users will not be redirected back to your service. You can still check on the status of these payments by making a GET request using the Location Header or Self Link, the same way you would if they were redirected, but just after a set time (eg, an hour). Note: GOV.UK Pay will eventually expire incomplete payments, but you should expect an occasional success or failure if the user experienced problems right at the moment of the redirect. 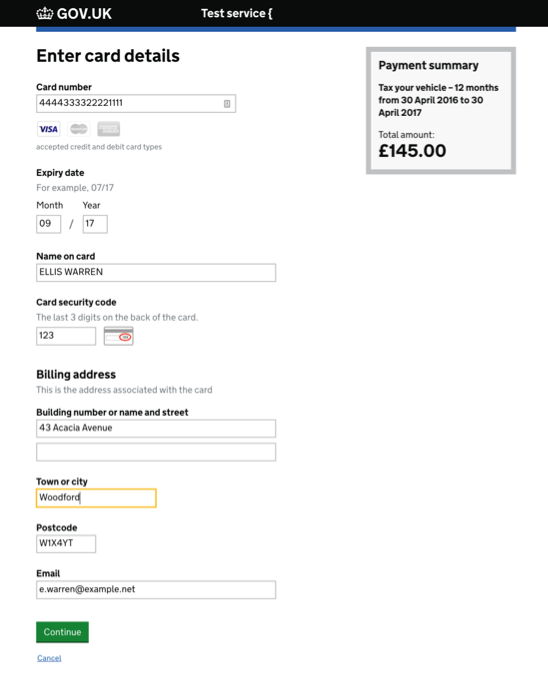 If a user does not have enough funds in their account to make a payment, the current GOV.UK Pay frontend will not let them try again with separate card details. This will soon be fixed as part of the beta. You can cancel a payment that is not yet in a final state by using the Cancel payment API call. If you’re a beta partner, the GOV.UK Pay team will hold technical workshops with you to discuss how to integrate the reporting from GOV.UK Pay with your own financial systems. GOV.UK Pay now supports refunding payments. You can choose to refund part of a payment, or the full amount. After issuing a partial refund of a payment, you can issue further partial refunds, until the full amount of the original payment has been refunded. unavailable It is not possible to refund the payment: for example, the payment failed. available It's possible to initiate a refund. Note that this does not mean that the full original value of the payment is available to refund: there may have been previous partial refunds. In the sandbox, you will not see the pending status as there is no delay in processing a payment. In a live environment, successful payments will spend some time in pending state before a refund becomes possible. This refund status is a property of a payment; each refund will also have its own status of submitted/success/error. 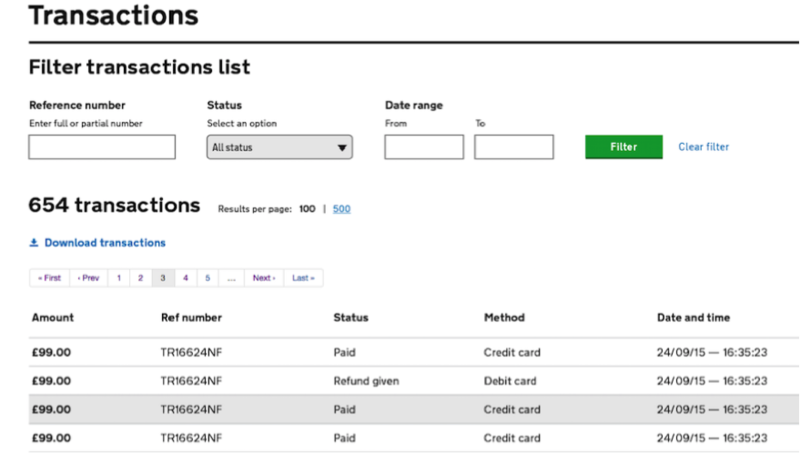 You can find out the refund status of a payment with the API using the Find payment by ID or Search payments functions. In this example, the refund status of the payment is available, indicating that a refund can be initiated. The amount_available value is 5000: that is, £50 is available to be refunded. Partial refunds are possible, and you can make multiple partial refunds against the same payment. As you'd expect, the total of refunds against a payment can't be greater than the original payment. In this case, the original payment was for £90. The amount_available value shows that only £60 is available to be refunded, because £30 has already been refunded in one or more partial refunds (as shown by amount_submitted). If you needed to know the details of the partial refunds (for example, whether there had been a single refund of £30 or multiple smaller refunds), you could use the API function to Get all refunds for a payment. When you submit a refund request for a payment via the API, you can optionally specify a refund_amount_available value in the body of the request. This is so you can provide the total amount of the original payment you expect to be available for refund at the time your refund request is made. The purpose of this is to prevent accidentally processing a partial refund more than once, by rejecting requests where your refund_amount_available doesn't match the real amount that's available to be refunded. For example, suppose a payment was made for £5, but later it turns out the user is due a £2 refund. Your system for processing refunds submits a request for a £2 refund to our API, but it accidentally gets sent twice. Without a refund_amount_available specified, GOV.UK PAY would have no way to tell the second request was a mistake, so it would process both requests, generating two refunds of £2 each. Now imagine the same scenario, but if you had specified the refund_amount_available as £5. The first request still succeeds, leaving £3 available to be refunded. When the accidental duplicate request comes in, it has a refund_amount_available of £5, even though only £3 is available, so GOV.UK PAY can tell that it's a stale request, and it is rejected. We recommend that your service tracks the expected refund amount available and submits a refund_amount_available value whenever you request a refund via the API. When a refund request is rejected due to a refund amount available mismatch, the error code returned is P0604, with an HTTP status of 412. You can initiate a refund with the Submit a refund for a payment function. You need to specify the paymentId of the original payment, and provide the amount to refund (in pence). You can use the Get all refunds for a payment function to get information all the refunds for a payment (including their refund_ids). You can retrieve information about an individual refund using the Find payment refund by ID function. When you try to create a refund with the API, it may fail immediately - for example if you try to refund more than the amount available. In that case, the original Submit a refund for a payment request will return an error code and a description of what it means. (A refund attempt that fails like this with an error code is not assigned a refundId and is not available using Find payment refund by ID). If accepted by GOV.UK Pay, a refund may still go on to fail at the PSP. This may happen if the card involved is cancelled or has expired, or if your account with the PSP does not have enough funds to cover the refund. Each refund has a processing status indicated by a "status" value that is returned in response to a successful request to a /refunds/ endpoint. Initially, in a live environment, the status returned will be submitted. After the PSP has processed the refund, the status returned will be success or error. (In the sandbox environment, the status will always go straight to success). submitted The refund request is valid as far as GOV.UK Pay can tell and has been passed to the underlying payment processor. error It was not possible for the payment processor to make the refund. To handle this, you must use Find payment refund by ID to check the processing status of the refund until it changes to either success or error. It will typically take 30 minutes for the status to change. We suggest you check the status after 30 minutes, and do not repeat more than once every 5 minutes. In the event of an error, GOV.UK Pay will not currently provide any more information. Please contact us if more information is required about why a refund failed. As an alternative to refunding via the API, you can use the admin console at https://selfservice.payments.service.gov.uk to view transactions and issue refunds. Go to the Transactions section of the site to see a list of transactions. In this list, click on the reference for an individual payment (in the Reference number column) to see details of that payment (including any previous refunds). In the details view, you can use the red Refund payment button at the upper right to carry out a full or partial payment. End users are automatically notified by email about payments (according to the settings you have entered in the self-service admin site), but not when a payment is refunded (either manually or via the API). You should arrange to notify end users about refunds as appropriate for your service. You will receive a sandbox account for testing in addition to your production credentials. To check your integration with GOV.UK Pay is working as expected, you’ll need to run a series of tests. We recommend that you build tests to include both the GOV.UK Pay API and its front end user journey. We are constantly iterating our interface, so you shouldn’t rely on any specific page layout, but you can build tests that address form elements (such as buttons) using their IDs. 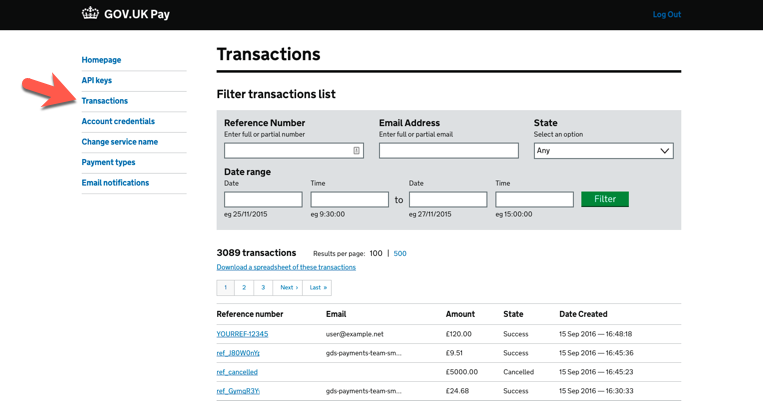 Alternatively, you can build stubs that will emulate GOV.UK Pay functionality. Our APIs will evolve over time. We will always let you know in advance if we intend to make any breaking, or backwards-incompatible API changes so you can ensure your service works with the new version. Please see our section on versioning for more information. There is guidance in the GOV.UK Service Manual on smoke testing. At the Government Digital Service, we tend to use Cucumber for testing (regardless of the core code language), as you can easily describe the behaviour you expect at the appropriate level. When you're testing your integration, you must not use real card numbers. Use the below test numbers. When you're using these card numbers, you can enter any valid value for the other details (name, expiry date, card security code etc). For example, it doesn't matter what expiry date you enter, but it must be in the future. 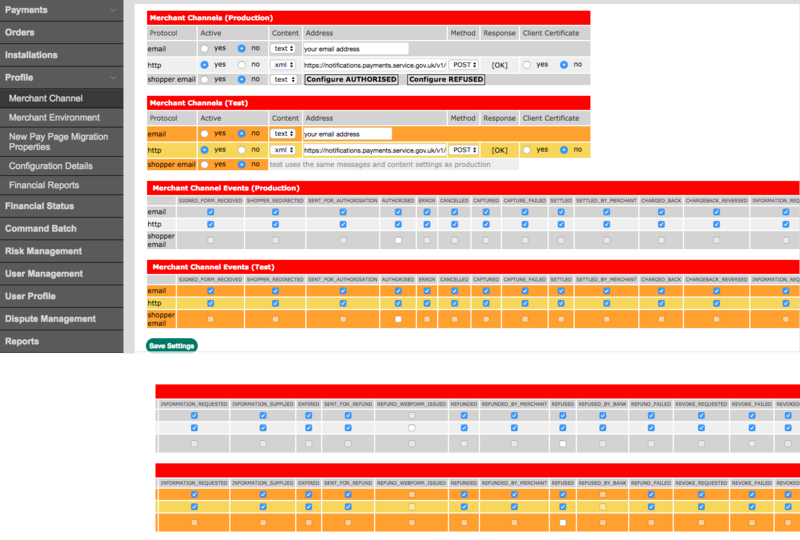 If you’d like to carry out any kind of performance testing, including in a rate-limiting environment, please contact us at govuk-pay-support@digital.cabinet-office.gov.uk. Once you have finished testing with your sandbox account, here are the steps you will need to take to switch over from testing to production. Go to the self-service admin site and log in with production credentials, not your sandbox credentials. Contact us if you need production credentials. While logged in with your production credentials, generate an API key for use with your production code. Set up the Worldpay account as explained in the section below. You must change some settings in your Worldpay account to get it ready for production use. 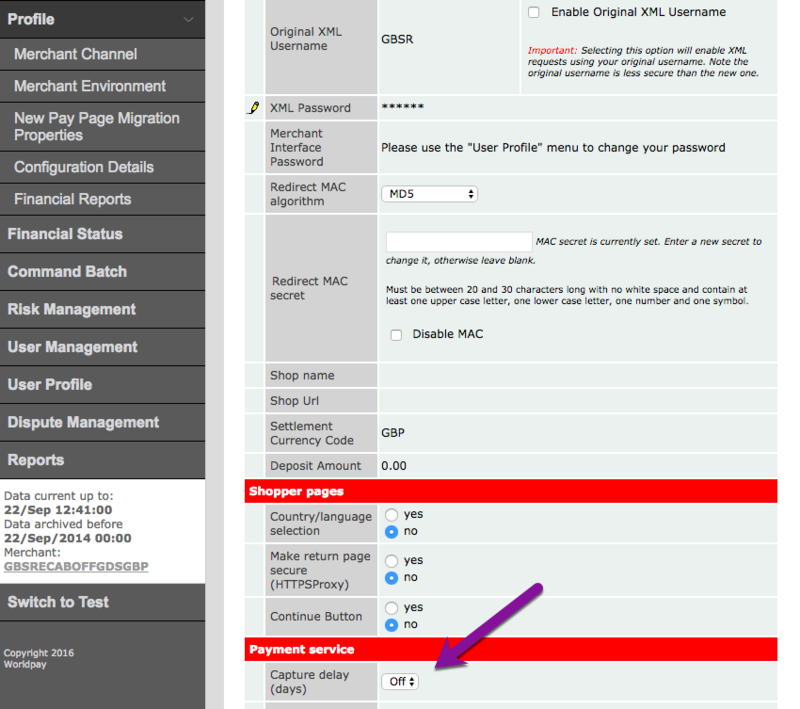 Log in to Worldpay and in your Worldpay profile, set Capture delay to "Off". If you want to use 3D Secure authentication for your payments, ask your Worldpay account manager to configure your merchant code (you cannot do this yourself by logging in to Worldpay). Ask them to enable 3D Secure for all payments. Once this is done, you can sign in to the GOV.UK Pay self-service admin site and turn on 3D Secure. Your service manager should have been given details of emergency contact methods to reach our support team in case of an urgent problem (for example, if you suspect that fraudulent transactions are being made on your account). Before you enter production, you should make sure that the right people on your team know how to report an emergency. Problem: Payments were working, but are now failing with 404 errors instead of specific error code. How do I troubleshoot this? Fix: Certain invalid requests can be rejected by our firewalls with a 404 rather than a specific error. We are working to provide more informative errors. Double-check that your call to v1/payments is valid. In particular, check that the return_url you are providing is valid and starts with https://, not http://. Problem: The "Example Request" code snippets in the API documentation always cause the request to fail with a "401 unauthorized" error. Fix: Remember that you must send the API key with "Bearer " in front of it (not including the quotation marks.) This is not made clear in the code examples due to a technical limitation. remember that you must actually use "Bearer " as the value. 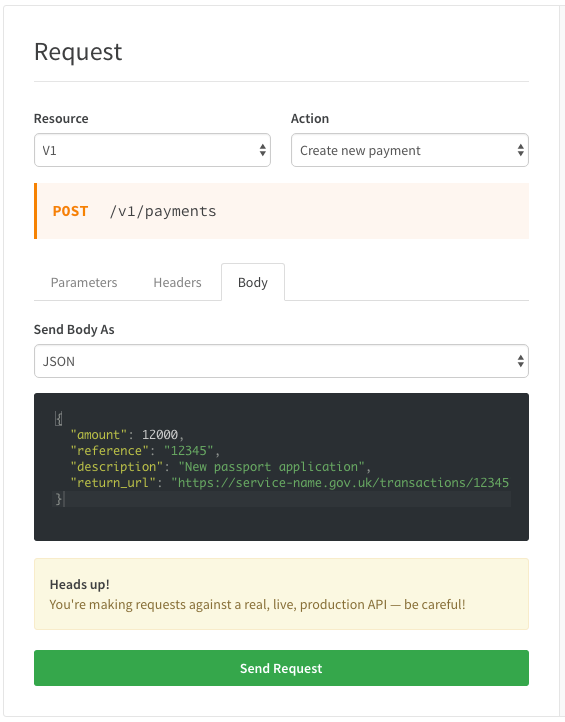 The current version of the GOV.UK Pay API is 1.0. When we add new properties to the JSON responses, the Pay API version number will not change. You should develop your service to ignore properties it does not understand. New, dated versions of the public API will be released if JSON values are removed in a backwards incompatible manner. All these versions of the Pay API will be documented in our Revision History table below. We’ll send you an email to let you know about any new versions of our API. We’ll support each version of the early beta Pay API for at least 1 month after we issue an upgrade notice. As the API matures, we may increase this support period to 3 or 6 months. Soon, we hope to let you check which version of our API you’re currently running by checking your dashboard. If you believe GOV.UK Pay security has been breached, contact us immediately at govuk-pay-support@digital.cabinet-office.gov.uk. If you are a production user and the suspected breach is severe, consider using the urgent contact details provided to your service manager. Please don’t disclose the suspected breach publically until it has been fixed. The GOV.UK Pay platform will let you create as many API keys as you want. We suggest letting all your developers experiment with their own test keys in the Sandbox environment, but keys for real integrations should only be shared with the minimum number of people necessary. This is because these keys can be used to create and manipulate payments. Do not commit these keys to public source code repositories. Revoke your key immediately using the self-service site if you believe it has been accidentally shared or compromised. If you believe your key has been used to make fraudulent payments, contact the GOV.UK support team using the urgent contact methods provided to your service manager. Make sure you’ve fully tested your integration with GOV.UK Pay. When doing so, take care not to use any real card numbers. Read our testing section for more details. A major benefit of integrating with GOV.UK Pay is that you’ll have immediate access to a fully secure and PCI accredited platform. The Payment Card Industry Security Standards Council is an open global forum, launched in 2006, that develops, maintains and manages the PCI Security Standards. These cover everything from the point of entry of card data into a system, to how the data is processed, through to secure payment applications. Compliance with PCI Security Standards is governed by the payment brands and their partners. Although the GOV.UK Pay team has completed the majority of work to ensure compliance with the PCI standard, your service may be asked by your payment provider to supply extra evidence on your internal security protocols. You will have to complete a self-assessment questionnaire called the PCI DSS SAQ that will include a series of yes or no questions about your security practises. Your service manager may also be asked to undertake security awareness training to ensure they are qualified to handle credit card data. GOV.UK Pay follows government HTTPS security guidelines. The Hypertext Transfer Protocol Secure (HTTPS), which involves the Transport Layer Security (TLS) protocol is used by the platform to authenticate servers and clients/secure connections. Your government service will only be able to integrate with the GOV.UK Pay if it also uses HTTPS. Currently GOV.UK Pay is not open source, but we’re planning to change that very soon. At the moment, we can invite developers from other service teams to collaborate with us. We hope to soon invite everyone to be involved in our project, allowing you all to raise pull requests on Github and contribute to our code. Please stay tuned. If your problem is not addressed in this documentation, please contact us at govuk-pay-support@digital.cabinet-office.gov.uk, including any error messages you’re getting. GOV.UK Pay publishes a newsletter every few weeks. This will help you stay updated with any new features we release. We’ll also blog about our progress using the Government as a Platform blog or the GDS blog. We’re looking forward to producing these. Please bear with us. If you are a beta partner and think your service could to be featured in our case study section, please contact us. Service account an account for a partner service with GOV.UK Pay. It is this account that staff users will be accessing. The Service Account will associate all relevant information and preferences with a particular service (e.g. transaction history, selected providers, accepted payment methods, etc).